It's been an eventful week... which means I've been eating out more than I normally do, and cooking less at home. 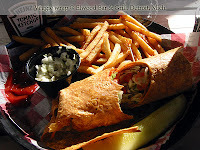 Rather than blow off my blog, I hope you don't mind that I'm posting veggie meals I've eaten at restaurants. Last night, my sis and I went downtown Detroit to see alt-country artist Ryan Adams for an intimate gig at the Gem Theater. Just a hop from the theater is the Elwood Bar & Grill, located on the corner of Adams and Brush. It was a nice day, and they had outdoor seating, so we grabbed a table on the patio and perused the menu options. As you can see, they are veggie-friendly!! Yay! I ordered the Veggie Roll-Up, but in retrospect, I should've tried the Portabella "burger," because the wrap wasn't anything special. It wasn't terrible, but I've had better veggie wraps elsewhere. The one just didn't make me go "Mmmmmmmmm...." like I do when I find an exceptional veggie treat in a restaurant. Still, this restaurant is right smack in the middle of Comerica Park and Ford Field, so if you're ever in Detroit for a Tigers or Lions game, this grill does give a veg*n some options.